Everything. All At Once. At The Same Time. Save Event: Everything. All At Once. At The Same Time. Share Everything. All At Once. At The Same Time. The central exhibition of the season features new works from William Roberts, Sam Venables, Ruffles aka Clare Charles & Becca Thomas, Gaia Persico and Cecile Johnson Soliz. The artists have each found ways to continue their studio practice alongside employment, whether it is by borrowing props, employing fabricators, creating work in the gaps between jobs or blurring the line between their practice and their jobs. The exhibition is less about short attention spans or the battle between distraction and focus; rather it's about uncovering our ability to absorb, assess and understand multiple streams of thought simultaneously. Cecile Johnson Soliz is intrigued by what happens when function, reproduction and public spaces come into art. Unable to find suitable workwear for her cold studio, she designed ‘Women’s Workwear, (Prototype)’ and hired a pattern-cutter to produce prototypes. She aims to have patterns made and printed for others to buy, adapt and make their own workwear. She is curious about why there are so many objects needed that do not yet exist. William Roberts works full-time as a technician, and uses a mobile app as his painting studio. He works onto the screen before becoming his own technician to scale up the images, or using other painters to make the 'real' paintings for him – trading time for money. He sees his artist self in the third person; his technician self is not the same person as the artist. Gaia Persico makes observational animations of cityscapes in which human presence is implied rather than seen. She observes these snapshots of urban infrastructure and sprawl from hotel rooms which double as a live-work studio between jobs. Using portable, accessible means to make work, Persico’s response to a place is disorientating. Her hotel world isolation limits connection with what lies beyond her window. We watch with her, held captivated between a non-event and the expectation that we will be shown otherwise. Ruffles is formed by a collaboration between Clare Charles & Becca Thomas who met in London, sewing knickers to make ends meet. Ruffles – a misspelling of an Italian snack bar – is an ongoing project that looks at the labour of hosting. Individually their practices transgress set boundaries in material practice to create social and civic-based work. Their role in making work can often be eclipsed by its function or use within a community. 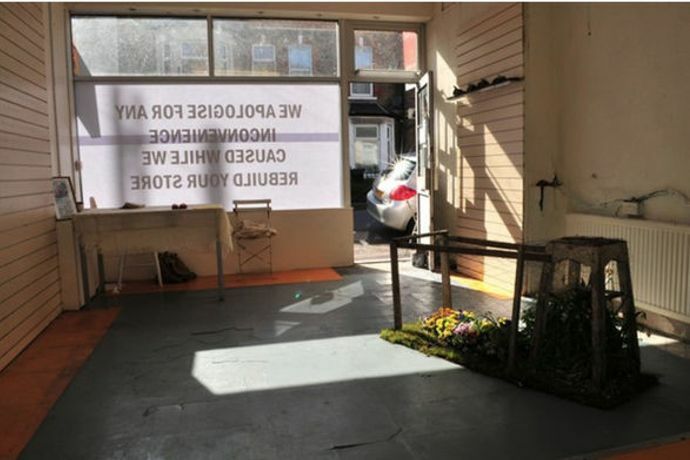 For this exhibition Rufles are producing a Kiosk – a sculpture that is also completely functional as a portable condensed workspace/ hub/ kitchen/ bar, wherever it is moved. We are often working in 'lost time', a space between the thing we are engaged with and the things we are planning to do. Can we find time in the middle of tasks that are required of us, to plan the things we want? The brain doesn’t really do tasks simultaneously as we thought or hoped it might. Multitasking – that desirable skill – is an efficiency myth. It might be better thought of as creativity. A creative detachment helps to connect different parts of the brain. Think of those moments when you find the word that you couldn't recall when you needed it, but it presents itself when your mind is otherwise engaged. Think of one hand not knowing what the other is doing, or those people who truly are ambidextrous. Think about the difficulty in patting your belly while rubbing your head or typing one word while listening to another. Multitasking may not be a strategy for efficiency after all, maybe it's a route to new ideas.